He's been called a hobo, local time traveler and authentic with a reputation that travels faster than the man himself. Once seen, he is unforgettable. 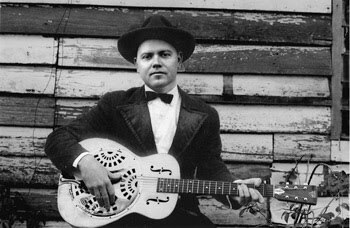 CW Stoneking will transport you back to a by gone era, with 20's style piano, delta blues guitar and rough voiced growl. It's like nothing you've seen in the past 90 years! CW Stoneking returns to the states with his one of a kind LIVE show. Listen to "Goin to the Country"
A true entertainer and raconteur, CW Stoneking plays guitar like a demon, wears natty threads, hollers like a 1920s tent show blues shouter and mutters to himself onstage. Drawing inspiration from influences that include pre-war blues, hillbilly, old jazz and prison work songs, the idiosyncratic CW Stoneking is a revelation and a delight, invoking the spirit of the 1920s Deep South blues like he’s just been beamed in from the past like a lost time traveller. Based in Melbourne, Australia, Stoneking is an inimitable singer/songwriter, evoking an original and diverse hokum style, using his trusty steel bodied dobro, his tenor banjo and a three piece Primitive Horn Orchestra. His debut album, King Hokum, was ARIA-nominated for Best Blues and Roots Album (2007), and winner of the AIR Award for Best Independent Blues & Roots Release (2007). The album was released in Europe via the Swiss Voodoo Rhythm label and CW Stoneking toured the continent and Britain during the summer of 2007, making waves at festivals and headline shows alike, while in Australia he has built up a fanatical following with his hugely charismatic and humour-laced live performances. It wasn’t until after he moved to Balmain in Sydney aged 11 that Stoneking began learning guitar. His interest in the blues was sparked as a teenager after stumbling across some tapes of two country-blues legends; Blind Willie McTell and Memphis Minnie. Stoneking’s music embraces Robert Johnson-esque delta and Mississippi blues, delivered with a voice soaked in sailor’s rum, full of woe and redolent of the callous-worn, tough skin of hard-won experience, and apparently broadcast from a perfectly preserved 1920s crystal set. He’s been called a hobo, local time traveller, fake and authentic with a reputation that travels faster than the man himself. Once seen, he is unforgettable.